Our pumpkin patch has been fruitful this year with large pumpkins! Did you know that you won’t pay more than $11.99 for a pumpkin here no matter how large it is? We charge by the pound but stop at $11.99. Sweet deal! Oswego pumpkin patch is open daily 9-6pm. We also sell carving kits! 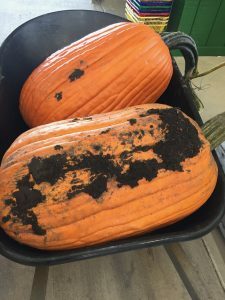 Our Naperville and Oswego Farmstands also have pre-picked pumpkins for your convenience. See our Pumpkins webpage for details.